USB Powered Stereo Home Desktop Computer External Speaker, fashion design shape, with usb plug/3.5mm audio plug, nice gift for teenage or lover etc, ideal for desktop PC/laptops mostly tablets.Get it to enjoy the life of the music. The standard 3.5mm audio plug is board compatible such as laptops, desktop PC, tablets, external battery and connects to audio player and multimedia device. No need to install the driver, just plug and play. The aesthetic appearance looks fashionable. It's a great affordable gift for family, friends and for yourself. Size of a single box for speaker: 3.3"×3 "×5 ". [Clear Sound] Built-in perfect noise cancelling device, these desktop computer speakers make excellent stereo clear sound. If you place two speakers on each side of the computer, the sound will be transmitted to your left and right ears simultaneously, producing similar stereo sound. Ideal for listening to music, watching movies or playing games at home. [Fashion Design] The appearance of the trapezoidal design makes it very fashionable. Very suitable for decorating your computer desktop. The glittering and translucent appearance makes the loudspeaker box looks attractive,so cute&fashion as a nice gift for kids&young people. These computer speakers can be a nice gift. [Widely Compatibility] Having two boxes, standard Usb powered plug, 3.5mm audio plug, line control for volume. Compatible with mostly devices, like laptops, PC, IPAD, computer. 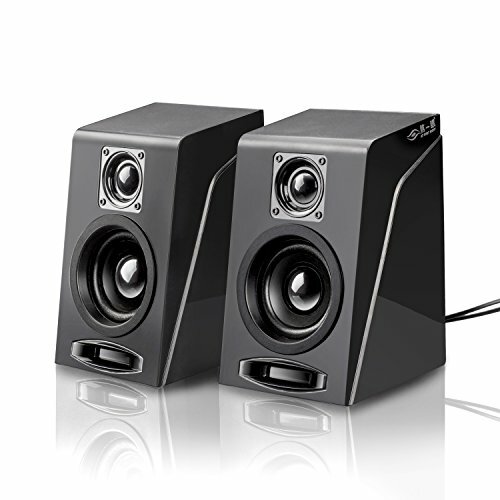 This computer speaker is suitable for most audio devices on the market. If you have any questions about this product by Meetuo, contact us by completing and submitting the form below. If you are looking for a specif part number, please include it with your message.